Ave Maria! Pope Francis makes 67th visit to the Basilica of St. Mary Major in Rome where our friars staff the sacristy. We have a Marian Pope. 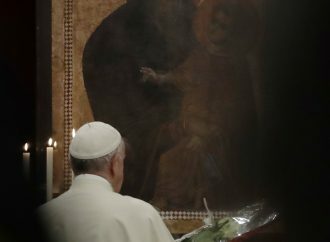 “ROME – On Tuesday, Pope Francis’s longstanding love affair with the Virgin Mary was again on display when, for the staggering 67th time as Bishop of Rome, he visited the Basilica of Saint Mary Major ahead of his Jan. 23-28 visit to Panama. Not only is the sheer number of visits indicative of the deep Marian devotion that has followed Francis from Buenos Aires to Rome, but they reflect his own personal spirituality as well as showing just how seriously he takes his role as shepherd of the Roman diocese. Since the beginning of his pontificate, Francis has placed a strong emphasis on his role as Bishop of Rome, vowing to be present in the diocese as much as possible – a commitment that could be due in part to grievances among some locals that his predecessor St. John Paul II was always on the road, leaving at least some Romans feeling a bit neglected.